Vixen is returning from hunting, when she hears Fox’s cry of distress. She finds him standing over the body of Dreamer. The cub has been killed, and the foxes are certain it is the work of Scarface. 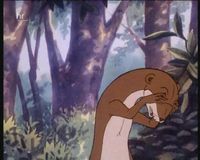 Weasel turns up and confesses that Scarface bullied her into spying on Fox, but that she refused to give him information. Bold wants Fox to avenge his sister’s death, but Fox does not want to start a war, especially as they cannot prove Scarface killed Dreamer. Bold berates his father for not taking action, and heads off towards Scarface’s land on his own. On the way he meets Adder, who decides to follow the young cub. At Fox’s earth, Charmer, Friendly and Badger are comforting Vixen, when Mole’s son Mossy arrives, and poor old Badger believes he is Mole. Badger is beginning to lose his senses, and Vixen persuades Mossy to play along at pretending to be Mole, to make Badger happy. Bold arrives on Scarface’s land, and meets his son, Ranger. The cubs are civil to each other, but then Scarface and his whole tribe arrive and capture Bold. 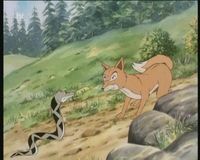 Adder, who has seen everything, rushes back and finds Hare who takes the message to Fox and Vixen. Fox and Friendly head off to try and rescue Bold. Kestrel flies with them. 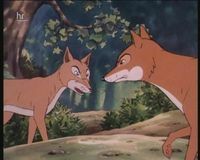 The blue foxes soon capture them, but Fox persuades them to let Friendly go. Meanwhile Weasel has heard that Bold has been kidnapped. Measly gives her the idea to go and see the White Stag. In the mean time, Bold manages to escape from the cave where he was being held, and makes it back to Farthing land. Friendly returns and explains Fox’s sacrifice. Badger decides to go to Fox’s aid. What could that old codger do? asks Bold. Badger? More than you apparently, replies Vixen angrily. Owl and Badger arrive at Scarface’s land to find the White Stag standing between Fox and the blue foxes. Scarface denies that he has taken Bold prisoner. The White Stag is satisfied with this and tells Scarface to let Fox go. When Fox returns safely to his earth, the animals celebrate, and give Weasel three cheers when they realise it was her who had got the White Stag to intervene. Fox angrily turns on Bold, but Bold is having none of it, he is leaving. This park just isn’t big enough for both of us, is it Dad? So I’ll say goodbye, for ever. 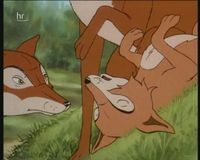 Vixen tries to stop Bold, but Fox tells her to let him go, and Bold turns his back on his family and White Deer Park.